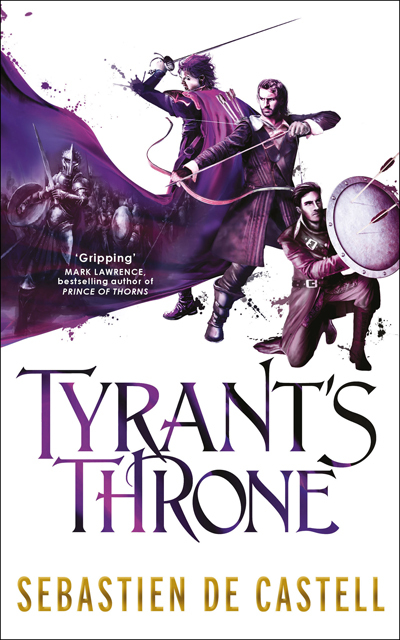 Falcio val Mond, First Cantor of the Greatcoats, is on the brink of fulfilling his dead King’s dream: soon, Aline will take the throne and restore the rule of law once and for all. But in Tristia, nothing is ever that simple. In neighbouring Avares, an enigmatic warlord has risen, and his closest ally is none other than Falcio’s old nemesis Trin. With the armies of Avares at her back, she’ll be unstoppable. Falcio, Kest and Brasti go racing north to stop her, but in those treacherous climes they discover something altogether different, and far more dangerous . . .
Sebastien de Castell had just finished a degree in Archaeology when he started work on his first dig. Four hours later he realized how much he actually hated archaeology and left to pursue a very focused career as a musician, ombudsman, interaction designer, fight choreographer, teacher, project manager, actor, and product strategist. His only defence against the charge of unbridled dilettantism is that he genuinely likes doing these things and that, in one way or another, each of these fields plays a role in his writing. He sternly resists the accusation of being a Renaissance Man in the hopes that more people will label him that way. Sebastien is the author of the acclaimed swashbuckling fantasy series, The Greatcoats. His debut novel, Traitor’s Blade, was shortlisted for the 2014 Goodreads Choice Award for Best Fantasy. the Gemmell Morningstar Award for Best Debut, the Prix Imaginales for Best Foreign Work, and the John W. Campbell Award for Best New Writer. He lives in Vancouver, Canada with his lovely wife and two belligerent cats.